We are pleased to announce a new release of StoriesOnBoard. This release’s biggest improvement is real-time collaboration. Working together on the same map at the same time wasn’t the most pleasant experience in StoriesOnBoard because you always needed to refresh the board to see each other’s changes. From today, when others are making changes to the map their changes will appear immediately on your screen. the changes will be instantly appearing on your screen. Even when someone changes a card in Jira, Trello or Pivotal Tracker, those updates will be seen on the map without a refresh. We also have an experimental feature for giving presentations with StoriesOnBoard. On a meeting with remote members, one can be a presenter and others can choose to follow her. Followers can see what card the presenter is selecting and the cards details screen is also opened when the presenter is opening it. Please try it and let us know how it works for you at your meetings. You can move a map to another workspace where you have permission to create new maps. This is useful in case you had created your own workspace first, but later you or someone created a company workspace and you’d like to move into a common workspace. It will be more important when StoriesOnBoard will go out of beta because a subscription will be tied to a workspace and the plans will be based on the number of members in a workspace. 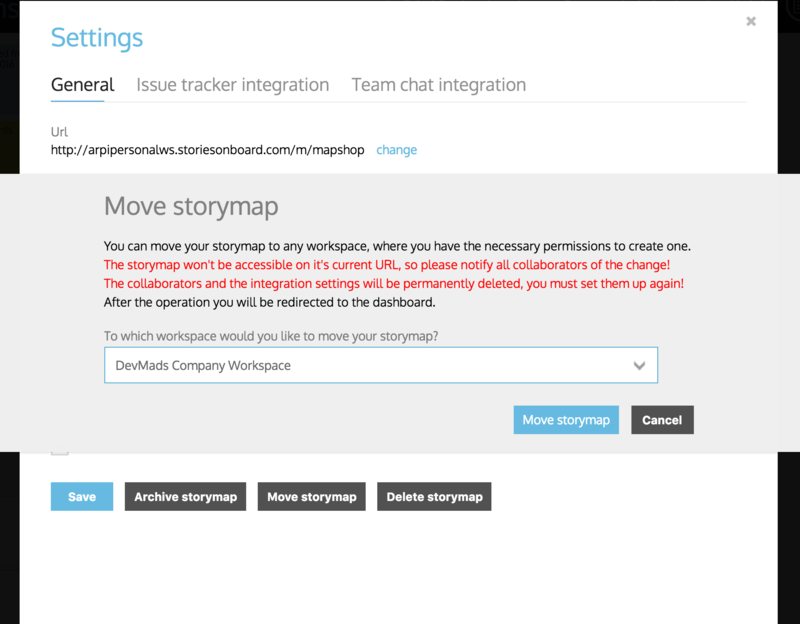 but it doesn’t move the map’s collaborators, issue tracker integration settings and team chat integration settings. You need to share the map again in its new workspace and set it’s integration settings. When the map in it’s new place is connected to the same board in Trello, or the same project in Pivotal Tracker, or the same Jira instance and project, then the cards’ connection will be preserved, they will remain connected to their respective items in the integrated tool. We are pleased to announce that StoriesOnBoard will end it’s beta period soon. Currently, we are working on turning it into a subscription-based service. We’d like to thank all the support we got from you so far. What it will mean to you? StoriesOnBoard will improve faster. We’ve got so many great requests and ideas from you. Finally, we’ll able to deal with them faster, once we can dedicate our time to the tool. As always any feedback is greatly appreciated. Please use our feedback widget at the bottom right corner of the application.